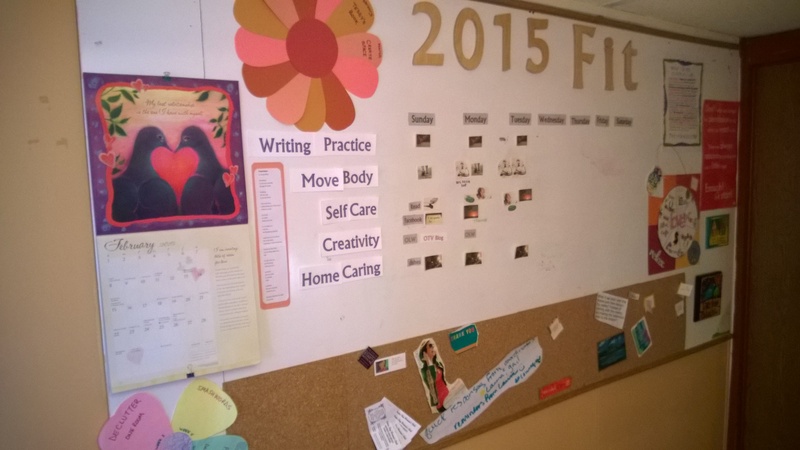 My theme for 2015 is FIT and my visual board helps me stay on track. It inspires and cajoles me to add images as I complete a daily activity or task. There are images of writing for morning pages; a cartoon character on a treadmill; a sunrise for my morning gratitude ritual; sneakered feet on a path for walking. All of these images support my overall theme of fit for life—in all areas of my life. And visually I can see where the holes are in any area. Interestingly, self care has had the most images every day! I created a flower with 12 petals one for each month and a theme for that month that fits in with my yearly theme. So far I’ve only labeled the first few petals. 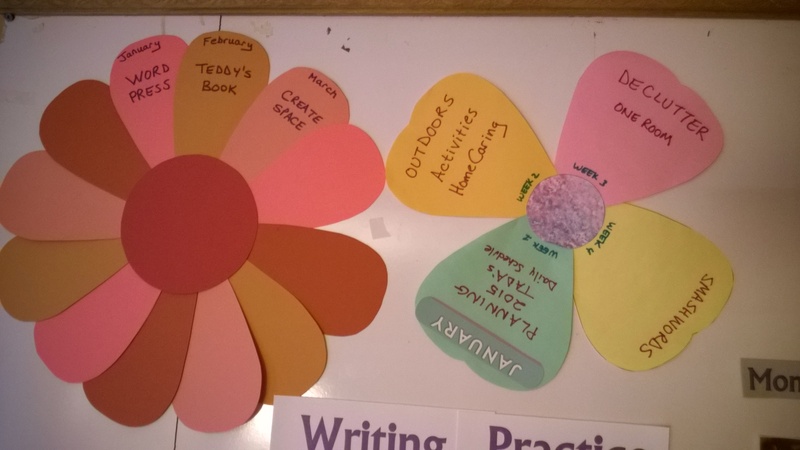 Next I made a monthly flower with four petals—a theme for each week, baby steps to be taken that week to reach a goal or destination. I love how having a mini theme each week keeps me on track and focused! Breaking down my big picture theme into smaller chunks makes the puzzle pieces of life fit together smoothly and naturally. Now that’s flower power! 06 Feb	This entry was written by Laura and published on February 6, 2015 at 10:37 pm. 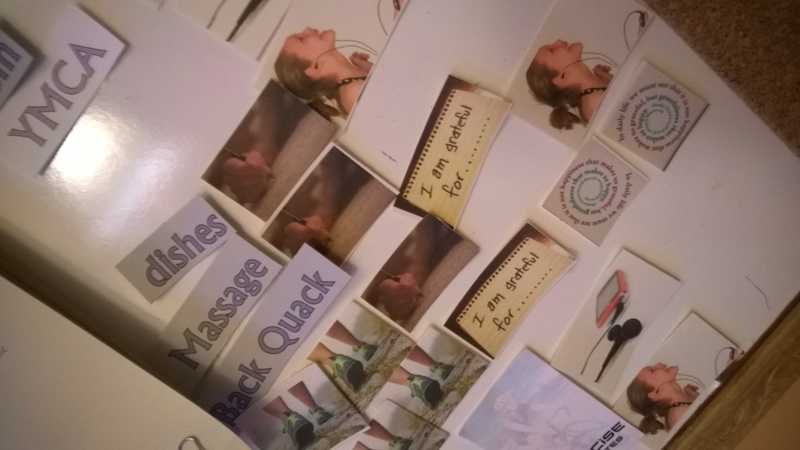 It’s filed under Commitment, Creativity, Gratitude, Inspiration, Laura, Lifeology, Project 137, Self Care. Bookmark the permalink. Follow any comments here with the RSS feed for this post. Oh my my! How I love your visual board and your schematics for keeping everything visible and front and center…thinking I have to mull this one over and see how I can adapt for me…I’ve lotsa wall space, totally unadorned. Me too, me too!!! I’ve been following Ali’s lead on the board; and while they capture This Point in Time, often feel disconnected from actions on my word. Thanks yet again, Ms. Laura!